A gestational surrogacy is one where the surrogate is not genetically related to the child. Florida Statute 742.15 provides that a gestational surrogacy agreement is binding and enforceable only if the commissioning couple (also called “intended parents”) is legally married, has at least one Intended Parent with a genetic connection to the child, and is over the age of 18. The gestational surrogate must be over 18 as well (though many clinics require she be over 21). We are fortunate in Florida that we have a statute that permits and governs this relationship, as many states do not have statutes, or outlaw gestational surrogacy altogether. While the surrogate will have no genetic connection to the child, it is still important to address the intent, rights, and responsibilities of the parties in the Gestational Surrogacy Agreement. Consequences for breach of such agreement should be addressed as well. It is important to choose a lawyer who specializes in Florida surrogacy law so that the contract is thoroughly drafted and the subsequent court proceedings in Florida are properly handled. 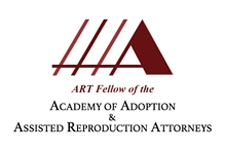 If you are single, an unmarried couple, or considering embryo donation along with using a surrogate, Florida’s Preplanned Adoption Agreement statute will provide the legal path for you to grow your family with the help of assisted reproductive technology.